The basics of this air rocket pictured above is the projectile, attached by tube to a large bladder which when compressed by external force, ejects the projectile upwards. These are the same features of a popliteal venous aneurysm. First, the large chamber predisposes to stasis and thrombus formation. This thrombus will form on the flaccid walls which are areas where stasis occurs. During activity, it likely dislodge but catch at the outflow, obstructing it. Pressure builds up in the calf veins below, and flexing the knee and pressing the venous aneurysm ejects the thrombus towards the heart and lungs. Clot Gun. The patient is a young woman who was an active college athlete. She had her first pulmonary embolism occur during practice several years prior to presentation. A duplex noted residual thrombus in her right popliteal vein. Over the next several years, she had two more episodes of pulmonary embolism whenever her anticoagulation was stopped. No thrombophilia was detected on workup. She was referred to the Clinic and Dr. Jerry Bartholomew in the Department of Cardiovascular Medicine noted in her records a mention of a dilated popliteal vein. On examination, she had no historical or physical examination findings to suggest a predisposition to pulmonary embolism. A duplex was ordered. The duplex showed a 2.8cm popliteal venous aneurysm of the right leg. No acute DVT was seen but swirling rouleaux could be seen on the B-mode video. A CT venogram was ordered. No other defect was detected. Operation was planned. Mapping showed no suitable superficial venous conduit, and venorrhaphy was planned. The patient was kept anticoagulated to the day of operation. A curvilinear incision (lazy S) was made across the popliteal fossa and careful dissection revealed the aneurysm. It was soft and the vein was normal below in the calf. Above it, there was a tight fibrous band that was contricting it -a popliteal venous entrapment. I released this band. Using a 24 French Foley catheter inserted through a transverse venotomy on the popliteal vein below, the aneurysm was plicated to approximately 1cm diameter, and the catheter removed and the venotomy repaired. The nerves were restored to their original position and the wound closed in layers. She recovered well and returned to followup about a month later. Duplex showed a patent vein and she had no symptoms of dyspnea. The plan is to have her come off of her anticoagulation after a visit with Dr.Bartholomew. Reviewing the literature, my confreres at Mayo published their 15 year experience with popliteal venous aneurysms and found that 5 of their 8 patients presented with pulmonary embolism, and that most of their complications occurred with bypass repair while aneurysmorrhaphy fared well (reference). Because of their rarity, about 200 cases in the literature, it may be assumed that many are not found until complications occur or never found because pulmonary embolism, the most common complication, results in death. Also, it would be easy for unknowing physicians to assume that popliteal venous aneurysm falls under the umbrella of varicose vein which this is not. They should be treated when found, and in most cases, such as this, venorrhaphy is preferred. Johnstone JK et al. Surgical treatment of popliteal venous aneurysms. Ann Vasc Surg 2015;29:1084-1089. The patient was referred to me after having undergone an intervention for chronic mesenteric ischemia. She is over 70 years of age and had lost over thirty pounds in 3 months due to severe abdominal pain with eating. A month prior to seeing me, she had undergone arteriography at an outside hospital and was found to have occlusion of her celiac axis (CA) and superior mesenteric artery (SMA) with a small but patent inferior mesenteric artery. 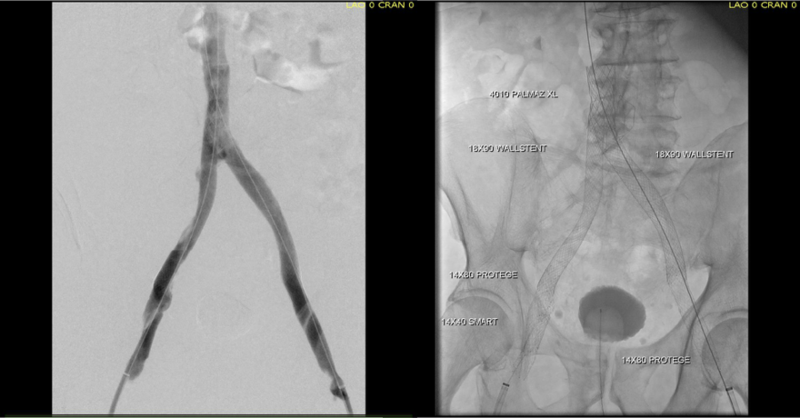 Attempt at recanalization, done from left brachial access, of the SMA was abandoned after the patient started having pain, and the inferior mesenteric artery was accessed and stented with a balloon expandable stent. Despite the stent, the pain persisted. On examination, she was cachectic, weighing about a hundred pounds, and had moderate to severe pain with abdominal palpation. 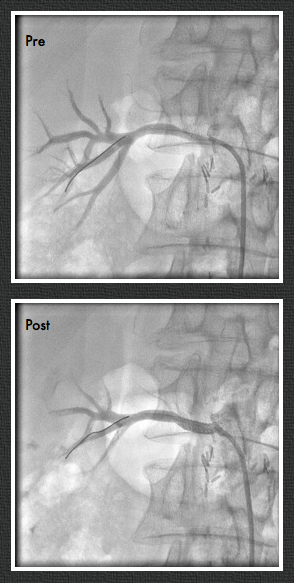 CT angiography (shown above) showed a chronically occluded CA and SMA and a patent stent to the IMA. After discussion with the patient about the possibility of a bypass, we decided to proceed with diagnostic arteriography and an attempt at recanalization. When planning these, I always try to come from the groin first as most of the time I am able to revascularize from below. I try to avoid 6F sheaths in the arms of thin cachectic patients -women especially where the brachial artery is likely the same diameter as a 6F sheath. The only downside about coming from below is that it is technically challenging and the stent comes off at a higher angle than the SMA typically has in situ. 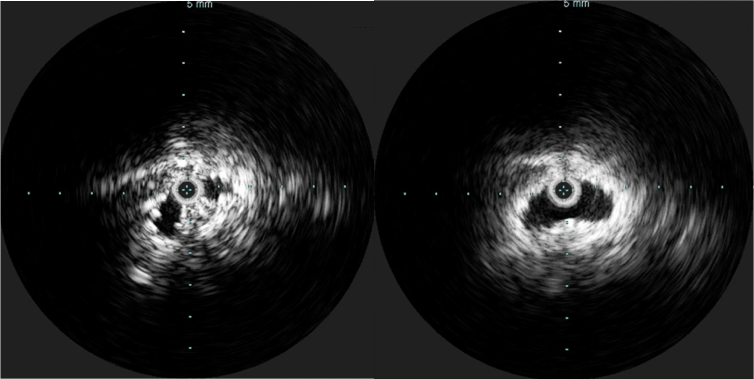 The series of images shows the initial aortogram and access. 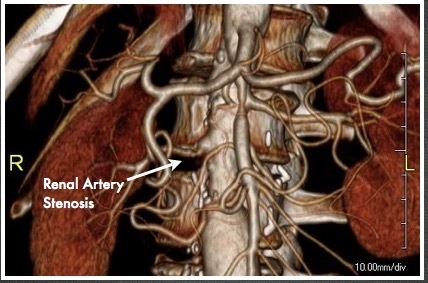 The superior mesenteric artery has a stenosis at the origin, with an area of post stenotic dilatation or small aneurysm, which occludes beyond the first three branches of the SMA. The IMA fails to feed the bowel -the later phases not shown shows filling from the SMA segment to the CA and ileal branches. The key step to this procedure is in getting “deep” access with a wire -in this case a floppy Glidewire, which I used to cross the occluded SMA. There is feedback from the tip which occurs if you spin it without a torque device. The wire has the quality, a feature really, of being tacky when dry, allowing for a great deal of coaxial spin with your first two fingers and your thumb. The tip transmits information about what it is crossing as you spin it -this is something that is hard to teach at first, but is gained largely through experience, but I learned it from Dan Clair over a decade ago when he barked at me to get rid of the torque device (“a tool for babies!”). The tip will go where it should if you spin, not push. Once the wire is buried, a suitable catheter that tracks well is brought across the occlusion. Again, while there are many catheters that can do this, the Glide Catheter is suitable again from spinning across an occlusion over the wire that would push out the lowest profile and equally hyrdophillic catheters. Once the catheter is buried, a suitably stiff wire (in this case a Rosen wire) should be brought across -this widens the arc created by the wire as it goes up and over the SMA origin and allows for delivery balloons and stents. Using the balloon-piton technique (a requisite for FEVAR), the sheath is brought into the SMA, securing access into it. The occlusion in the mid-SMA ballooned nicely and did not require a stent -a nonocclusive dissection is seen but I chose not to treat this as placing a stent is likely to cause as many problems as solve and the dissection is in line with flow. The origin was stented with a balloon expandable stent -having the patient awake is useful in determining if the stent is “big enough.” Final arteriography in two planes is shows below. Gratifyingly, the entire mesenteric system in the CA (foregut) and SMA (midgut) lit up. I admitted her for observation as I have seen patients develop bowel infarction with reperfusion which may be due to embolization but I think just as likely due to edema. Food needs to be reintroduced slowly as there maybe metabolic consequences to rapid refeeding. Her baseline lactate was 2.6mMol/L but came down to 0.8mMol/L the next day. Her other labs were normal. Her pain remitted and she was able to tolerate a regular diet by postoperative day 2. Mesenteric ischemia is a particularly morbid condition. When it presents acutely, there is a high mortality rate (ref 1). Revascularization in good risk individuals is still bypass surgery (ref 2,3). The inferior mesenteric artery offers a dismal revascularization target for this reason -while the artery will remodel and dilated in the setting of mesenteric ischemia, its orifice from the aorta does not and is usually no more than 1-2mm from birth to adulthood. Also, while the large bowel will get perfusion from the IMA, and the foregut may get collateral flow from collaterals fed from the middle colic via the Arc of Riolan, the midgut does not get sufficient flow from from the IMA because it requires the longest path to fill the ileal and jejunal branches. The development of atherosclerosis in the aorta further complicates attempts at stenting. 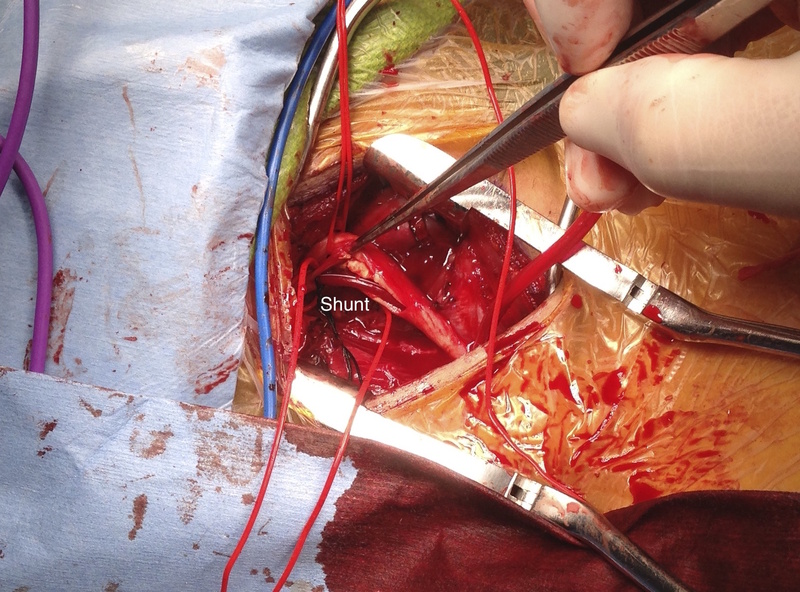 Despite this, it is still attempted (ref 4) and in 4 patients was successful at relieving pain for short periods of time, with one patient requiring eventual bypass despite characterization as “high risk.” It is a reflection of how poorly this vessel does with intervention that this 4 case series is the largest in the literature. The analogy to IMA stenting in the legs is stenting of a heavily diseased profunda femoral artery in the setting of critical limb ischemia with femoropopliteal occlusive disease. It is occasionally successful in the short term, but will only delay the inevitable operation. There are no low risk patients with severe weight loss due to mesenteric ischemia. Aggressive intervention offers a path of survival for these patients, and but long term results are only possible with bypass. Park WM, Gloviczki P, Cherry KJ Jr, Bower TC, Panneton JM, Schleck C, Ilstrup D, Harmsen WS, Noel AA. Contemporary management of acute mesenteric ischemia: factors associated with survival. J Vasc Surg. 2002;35(3);445-452. Park WM, Cherry KJ, Jr, Chua HK, Clark RC, Jenkins G, Harmsen WS, et al. Current results of open revascularization for chronic mesenteric ischemia: a standard for comparison. J Vasc Surg. 2002;35(5):853–859. Kasirajan K, O’Hara PJ, Gray BH, Hertzer NR, Clair DG, Greenberg RK, et al. Chronic mesenteric ischemia: open surgery versus percutaneous angioplasty and stenting. J Vasc Surg. 2001;33:63–71. 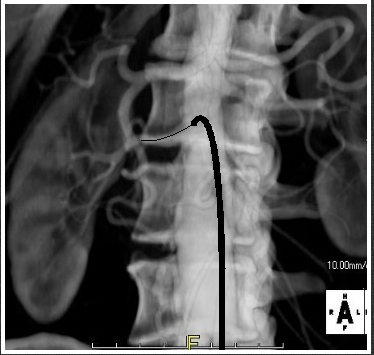 Wohlauer M, Kobeiter H, Desgranges P, Becquemin JP, Cochennec F. Inferior Mesenteric Artery Stenting as a Novel Treatment for Chronic Mesenteric Ischemia in Patients with an Occluded Superior Mesenteric Artery and Celiac Trunk. 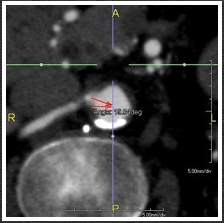 Eur J Vasc Endovasc Surg. 2014;27(3):e21-e23. 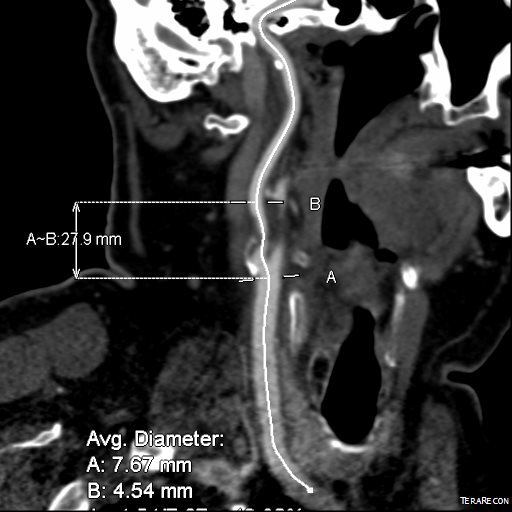 I was asked to assist one of my otolaryngology colleagues in extirpating a neck tumor that encroached on the carotid artery at the base of the skull early in my career. 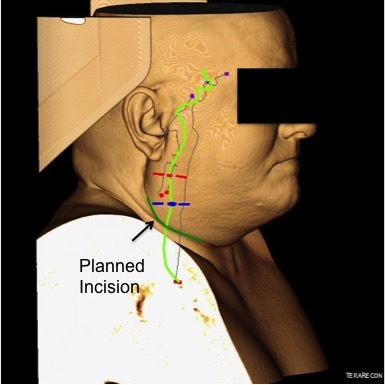 While the operation was complex and interesting, the most impressive part of it was the complete exposure of the neck from base of skull to the base of neck that was possible with an oblique skin line incision. This challenged bias I had about “exposure,” because up to that time, I had done the mastoid process to manubrium incision along the anterior border of the sternocleidomastoid muscle. What was doubly remarkable was that the incision was invisible in followup despite curling from ear to epiglottis because it was hidden in the fold under the submandibular fat. 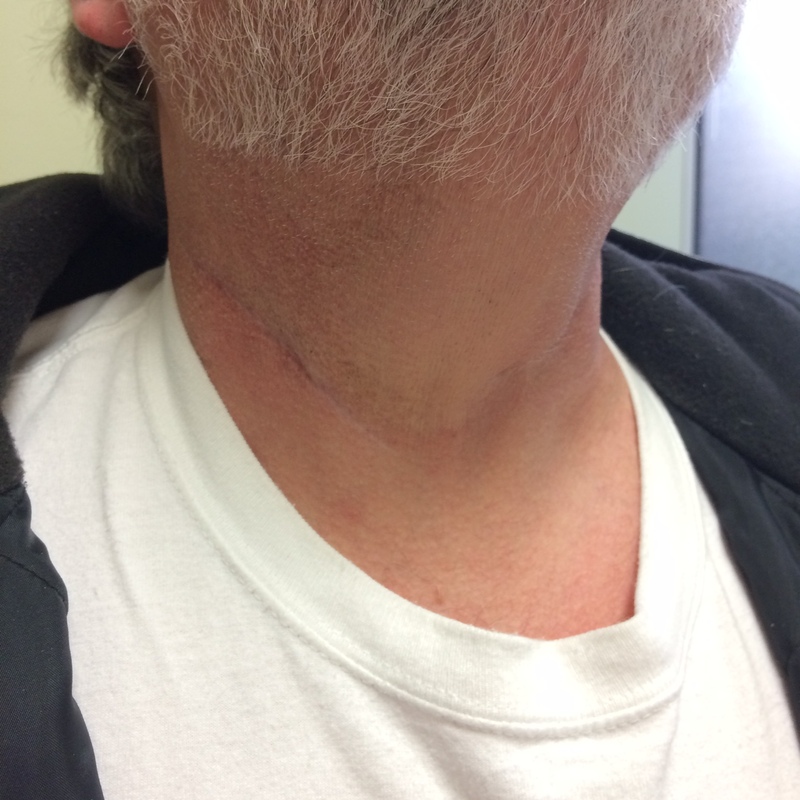 This patient above had his carotid endarterectomy performed with a skin line incision. He didn’t even need his beard shaved for the operation. The key is developing subplatysmal flaps like the kind you make with thyroidectomy. This allows cephalad and caudad exposure. More exposure means just extending the incision medially and laterally. These flaps heal well. 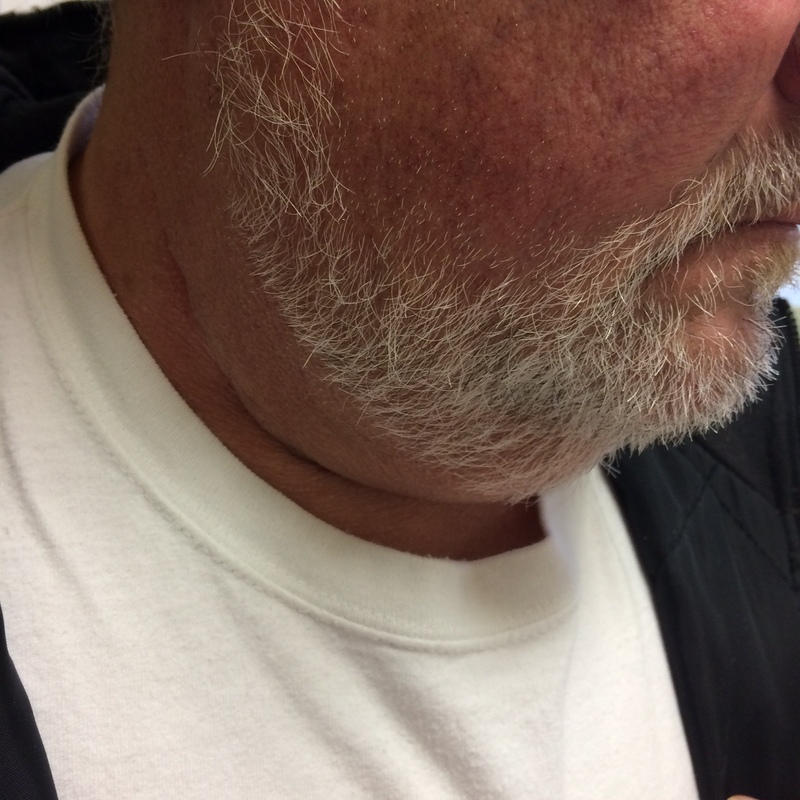 This with retraction allows for excellent exposure of the neck. The other advantage is that the fat is never cut across but completely avoided if you go under it and lift it up. The incision is far less disfiguring and heals well because the forces co-apt the skin without relying on tension from the closing sutures. Preop planning with CTA and 3D virtual reconstruction confirm where the incision should be placed. But most of all, the patients appreciate not having a scar on the neck that they have to constantly explain. Planning starts with visualizing the proximal and distal extend of plaque needed to be removed. The 3D reconstruction view can be “Window Level”-ed to bring in soft tissues and skin to anticipate the operative exposure. Experience has shown me that it is possible to avoid cutting through the fat on the neck, and what is visually the lower part of the face as much as it is the neck, but performing this oblique incision in the skin fold.